MoveClip "Left" with 4 holes in both male & female. MoveClip "Right" with 4 holes in both male & female. 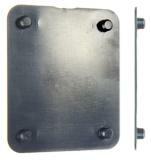 Mounting plate for tablet PC, touch screens etc. 110 X 70 mm. MultiMoveClip: adapter plate package of 5. MultiMoveClip: adapter plate for holder without tilt swivel. With AMPS holes. MultiMoveClip, 4 screws. High strength. With short release lever. MultiMoveClip: Adapter plate for holder without tilt swivel. With AMPS holes. High strength MultiMoveClip with release button included.